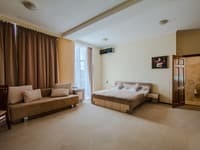 Hostel "Olympic" is located in the center of Kiev next to the Olympic Stadium. It offers compact, air-conditioned rooms with bunk beds. From the windows of the hostel you can see the Catholic Church of St. Nicholas. A shared kitchen with a microwave, a stove and a refrigerator are at guests' disposal. Other facilities at the Olimpiysky hostel include free Wi-Fi and 24-hour water supply. 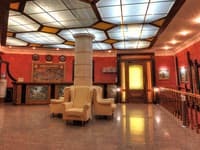 Within a two-minute walk are the restaurant "Kuvshin", the cafe "Jaguar Lounge" and "OK Bar". Metro station "Olympic" is located 300 meters from the hostel, the distance to the central railway station is 3.2 km. Boryspil Airport is 40 km away. The bus station is 3.9 km away. 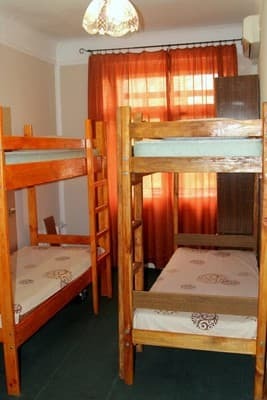 Description of the room: The shared 8-bed room is equipped with 4 bunk beds with orthopedic mattresses. Description of the room: In room 3 bunk beds with orthopedic mattresses. Description of the room: One-room female room. Equipped with 3 bunk beds. Очень понравилось, приятная хозяйка, чисто. Администратор всегда на месте, поэтому нет балагана, не шумно. Рекомендуем. Один санузел и одна ванная комната на 20 чел., маленькая кухня. Если утром всем надо выходить в одно время это очень неудобно. Вечером аналогичная ситуация. Администратор зачастую ведет себя не корректно. Очень приветливые и дружелюбные женщины-администраторы! Отлично выполняют свою работу. Всегда чисто, есть горячая вода, на кухне включен телевизор с любимыми сериалами и передачами. Спать можно хоть до обеда, тихо и хорошо. На кухне есть вся нужная посуда. Центр города, приятные виды из окна. Удобно гулять пешком, рядом есть нужные кафешки и магазины. Нельзя заявиться в хостел среди ночи, если это заранее не обговорено и не надо добро. Но это даже плюс - больше тишины. Удобное месторасположения, чистота, порядок, вежливый администратор. Отсутствие фена для сушки волос; в комнате негде присесть, если приходится спать на втором ярусе, поработать с ноутбуком или просто посидеть отдохнуть - негде. Адміністрація уважна, йде на зустріч. Очень вежливая хозяйка, не навязчивая, сделала наше прибывание максимально комфортным. Повсюду идеальная чистота. Место очень удобное. В целом очень позитивные впечатления. Check arrival: from 14:00 - 23:00 hours. Check leaving: to 12:00 - 13:00 hours. Accommodation is possible only in the main places. A shared kitchen with a microwave, a stove and a refrigerator are at guests' disposal. Within a two-minute walk are the restaurant "Kuvshin", the cafe "Jaguar Lounge" and "OK Bar". 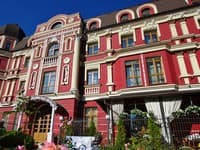 Hostel "Olympic" is located in the center of Kiev next to the Olympic Stadium. Metro station "Olympic" is located 300 meters from the hostel, the distance to the central railway station is 2.9 km. Boryspil Airport is 40 km away. From Khreshchatyk (metro station Maidan Nezalezhnosti) 2 stops to the metro station Olympic. 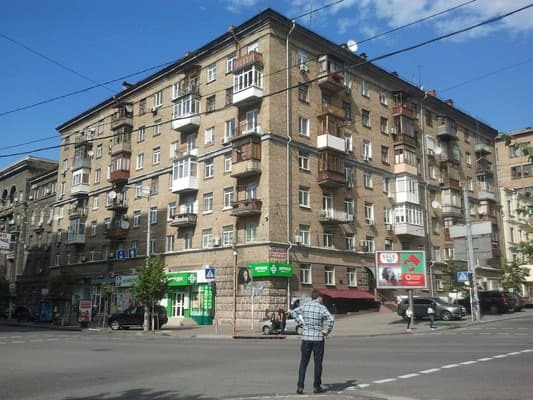 From the metro to the hostel 300 m. From the central railway station (metro station Vokzalnaya) go 3 stops to the station Khreshchatyk, change to the station Maidan Nezalezhnosti and go 2 stops to the station Olympic.